Wok hei — wok (鑊), a round-bottomed skillet and hei (氣), a gas or “energy” come together to translate as “breath of the wok”— is the quintessence of zi char in which dishes exude a smoky aroma only attained by cooking ingredients over a balanced heat. It’s no easy task to achieve this, but Wok Hey located at Bugis Junction strives to deliver this legendary art of stir-fry to us with a modern twist. 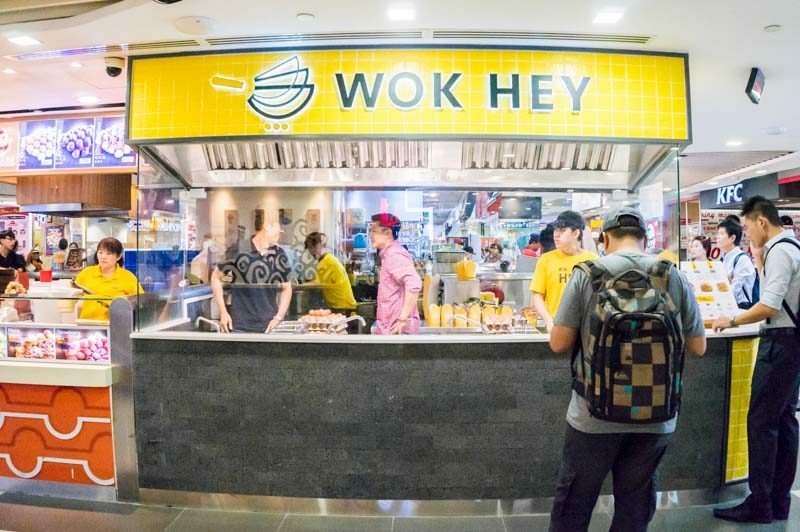 Recently renovated this July 2018, the takeaway kiosk now boasts a bright yellow signboard with bold letters reading “Wok Hey”, a cheeky play on wok hei. The open kitchen-style allows passersby to view the chefs in action, cooking up some fresh and good zi char upon order. What you see is what you get, right? Clad in the same yellow as their brand, the chefs were focused on heating and stirring the oil in the skillets before tossing in ingredients to begin their wok dance. The kitchen was designed to ensure maximum workflow and the best hygiene, resulting in speedy and delicious dishes. All the ingredients are neatly organised and on display, for customers to choose add-ons to their orders. Currently, Wok Hey offers base selections of egg fried rice, Shanghai fried rice, fresh ramen and fresh udon for customers to build their orders on. After the base order and the add-on ingredients are selected, the chefs then proceed to quickly toss the food together and pour in their house-made sauces. The woks were flying in the air while ladles moved back and forth, making sure all the ingredients mixed well. Cooking with a healthier oil option approved by the Health Promotion Board (HPB), the store stands by their minimised use of oil. While that’s good news to health junkies, it provides a challenge for the chefs — too much will leave the food fried (and unhealthy), too little and there’s no wok hei. The stir-fry is then served in American-Chinese-style takeaway boxes, compact and convenient to da bao back to the office or home. It’s also microwaveable, so you can pop these boxes in to warm the food up before digging in. Despite having only four base options to choose from, the flexible customisation granted us the opportunity to get playful and mix and match ingredients that we thought would work together. And for an additional $1 each, there were a wide variety of add-ons. On the Egg Fried Rice With Seasoned Prawns ($6.80, $5 on its own, $5.80 with Grilled Chicken, $6.80 with Braised Beef), I opted for tobiko ($1) as an add-on. I was pleasantly surprised to find the generous amount of the flying fish roe lying on the bed of fried rice. The prawns were plump and succulent and the Japanese rice was fluffy, accompanied by the fragrance of fried eggs, delighting my palate. Every spoonful had sweet tobiko which popped in each bite for a fun texture. Trust me, the fish eggs went perfectly with the fried rice and were so worth it as an add-on. And the most important question of all: did I taste the wok hei? Yes — there were hints of smokiness from the rice, subtle but present. For a healthier option, you can request for their premium brown rice at no additional cost. I ordered the Egg Fried Rice With Braised Beef ($6.80) but with Premium Jasmine Brown Rice and added Shimeji Mushroom ($1) along with Baby Spinach ($1). The brown rice turned out to be drier than the regular Japanese rice but was chewy nonetheless. The pieces of braised beef were tender albeit a tad dry and the mushrooms contributed a somewhat herbal taste to the overall fragrance of eggs. If I had to choose between the seasoned prawns or the braised beef, I’d go for the prawns. Rice-wise, however, it’s up to your preference. Going from light to heavy in taste, we moved on to the Shanghai Fried Rice ($5.50, $6.30 with Grilled Chicken, $7.30 with Braised Beef, $7.30 with Seasoned Prawns) and added Broccoli ($1) and halal Chicken Chinese Sausage ($1). Smothered in their house-made black sauce, every grain of rice was tinged brown and somehow, the texture was chewier. The eggs were slightly charred, giving it that guo ba flavour due to the burnt marks from the wok. The sauce wasn’t salty but strong in savoury flavours while the Chinese sausage had a bak kwa-like sweetness. If you’re more of a noodle person, you can try their Fresh Ramen With Seasoned Prawns ($7.80, $6 on its own, $6.80 with Grilled Chicken, $7.80 with Braised Beef) which automatically comes with cabbage and eggs. I also added Thai Asparagus ($1) for the extra crunch. The thin ramen noodles were springy yet soaked in a mild sweetness with smoky notes. The crunch from the asparagus gave a nice contrast to the noodles and their seasoned prawns had a satisfying juicy chomp once more. Those who prefer udon over ramen noodles can go for their fresh udon selections. Boiled and rapidly cooled down to maximise their chewiness, the noodles are prepared daily to ensure the freshest quality. Drizzled with their rich, goopy black sauce, the udon is then quickly stir-fried in the wok. The Fresh Udon With Grilled Chicken ($6.80, $6 on its own, $7.80 with Braised Beef, $7.80 with Seasoned Prawns) also comes with cabbage and eggs, but I added Nai Bai ($1) and a Sous Vide Egg ($1). Having absorbed the sauce, the udon was on the soggy side but still chewy. A word of advice is to slurp up the noodles quickly before it gets any soggier. The pieces of grilled chicken were tender, but chunkier sizes of the meat would’ve been heartier. That day, the sous vide egg was unfortunately overcooked but I couldn’t really complain about my favourite protein choice. I’m sure some of you may think their stir-fry is overpriced and would rather go for a cheap yet traditional style of zi char. Despite the compact packaging, I guarantee you the portion served is more generous than you might think. With fresh and healthier ingredients, the ability to customise your own meal, and not to mention the convenience, Wok Hey might just become your next go-to lunch spot.